2 CE hours with every issue! 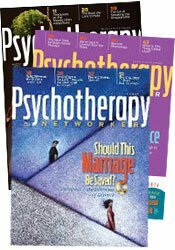 For more than 40 years, the award-winning Psychotherapy Networker magazine has been dedicated to helping you help your clients. With 6 issues a year and unlimited digital access to our archive, you can always feel connected to the therapeutic community, up to date on the latest research, and inspired to tackle your most challenging cases.